Quickie’s Burger & Wings has 2 1 location(s), 1 in Hollywood and the other in Pembroke Pines. The Hollywood location has a drive-thru but we won’t be using that today. The Menu has everything from Chicken to Mahi-Mahi Sandwiches but I think we all know the Burger and Wings is what they’re known for (if you don’t, you will soon). My wife Marcela orders the Quickie’s Original 1/3 pound Deluxe (meaning it brings Lettuce and Tomato) with Cheese & Bacon. I have the Quickie’s Original 1/2 pound with Bacon and Cheese (all Burgers have Onion Strings and Quickie’s Sauce) and 12 Wings (6 Golden BBQ and 6 Extremely Hot) for good measure. There are also weekly Burger specials which can be found on their Facebook page. I tried the Jerk burger. While the burger itself was good, the jerk sauce was little more than rance sauce with a few spices. It had no heat whatsoever, which is an important component of jerk seasoning in my opinion. It was great having you and Marcela in the store. It was even better that you enjoyed your meal. Thanks for getting the word out. We appreciate it. As for the 4LB Challenge–well, that burger has not been mastered. Two worthy attempts were made last Saturday, but no masters! Quickie's would like to invite you, the Burger Beast, to take the challenge on Saturday, November 21st, at six o'clock, as our guest (that doesn't mean we won't have you sign the release form…lol). We don't believe that such a master has been 'made' yet. Give us a call and let us know. I eat there all the time. I am a Quickie junkie! My favorite is their backyard BBQ-style burger and fries. You are right about dipping the fries in their sauce. It is the way to go. I'll see you there Mr. Burger Beast. Great post. Sounds like a place that's worth the drive. I saw this post a few days ago and today I happened to be in that neighborhood today so I stopped by for lunch. I had a burger and all I can say is that they are great. I had the deluxe. The lettuce and tomato were very fresh and the meat was cooked perfectly. Also worth mentioning that the staff was very friendly. No complaints here and Im a picky MF. I'll definitely be back. Thanks for the headsup Beast! I dined here yesterday and u was at first hesitant bc it's a small place…I'm sorry I just don't jump at small restaurants. I am so glad I gave this place a chance. We were greeted as soon as we walked in by the cashier. She noticed we were newbies and began talking to us about our options for a first time visit. I liked that! We had the 1/3 with and without cheese and wings combos. The burgers were juicy and didn't taste frozen. They were grilled nice and wo burn. The sauce was mild and good but I wouldn't dip my fries…sorry. I tried and it threw off my seasoned fry taste. The onion straws were perfect not oniony and Iove that!! The wings were very good. Mild was packin alittle punch wo the fire . The management and staff were so nice! They refilled our drinks wo us asking. I can tell other customers enjoy the personal attention to customer attention. Would I dine here again?? Yes. Today as a matter of fact! Totally overrated. I tried it. The burger was different for the fact it was grilled. I give it a 3 out of 5.
don't get me wrong it was good, but its certainly not the best burger in South FLA. I took my 7 year old son to Quickies on Saturday after reading the comments from Burger Beast. Our order was taken by Jacqueline who was just as nice and friendly as can be! The burgers were great and the fries were real good a swell. The place had a good vibe and I highly recommend it! I tried both Le Tub and Quickie and Quickie is definately more flavorful. Le Tub's was a HUGHE burger with good meat flavor but it needed more seasoning. it's a good burger but Quickie's char taste was GREAT. This place was overpriced for the average quality of food. I have a feeling that some of those highly positive reviews are fake. I stopped by the one in Pembroke Pines today. My wife and I shared the Philly cheesesteak and the mini-MOAB. The meat on the Philly cheesesteak was grey and bland plus they left off the mushrooms. The MOAB had absolutely no cheese in it at all…that was a huge disappointment because it was the main reason I ordered it. Service was 50-50. The blond girl who took our order and brought our food to the table was extremely friendly and courteous. The other Indian girl looked pissed off all the time and it was obvious she did not want to be there. Save your cash. There are better mom and pop burger shops in South FL who gladly appreciate your patronage. I have been to Quickie Burger since reading about it on Burger Beast. The place is great (Hollywood site). 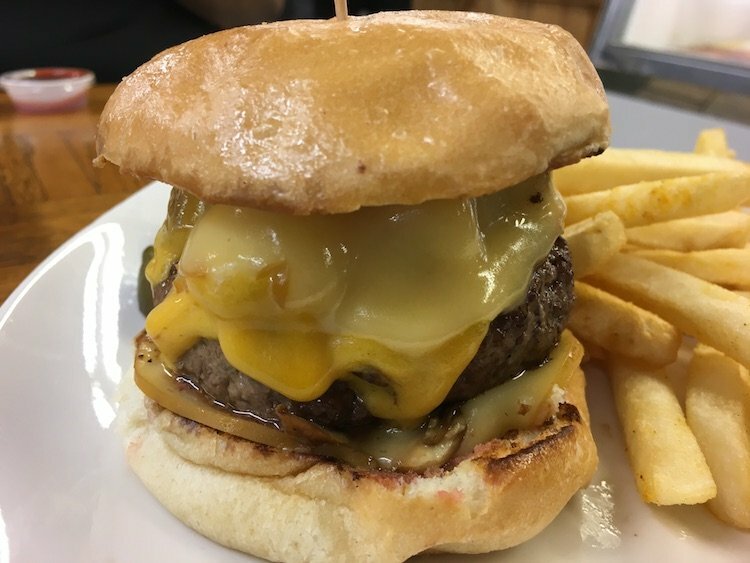 I have always had a great burger with a carmelized crust and perfectly prepared meat inside. I recently tried their Greek Burger with Feta Cheese. It is the type Burger that spills all over your plate and days later you are craving it again. I’ve even had the M.O.A.B., which stands for “Mother Of A Burger” I was told. It’s a full pound of pleasure coupled with all types of toppings. Their Quckie Sauce is a bit too bland. It should have a little more kick, but that’s a very minor glitch. The fries are seasoned nicely, but they’re not fresh cut. I would much prefer in a place like Quickies that the fries match the quality of the burgers, but they don’t. They are just OK. If you’re looking for a quality burger experience on 441 South of Hollywood Blvd. Quickies is definitely your best bet. Are all these comments/reviews real? Admin, why was my previous review not posted? I have several sites as well, and just because I refuse to provide my real email does not justify censoring my reviews of quickies…. I’ll check back. Your comment may have been considered Spam by the site. All my reviews are real as far as comments, I can’t really control that.